Shoppers in Gravesend last Saturday 7th March generously supported the Marie Curie Cancer Care Daffodil Day collection. 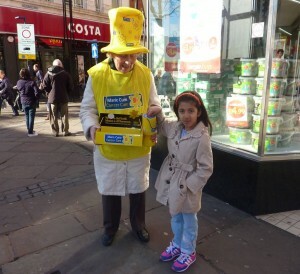 Rotary Club members were out in force in the town centre selling daffodil badges for the charity and raised over £350. Founded in 1948 to nurse cancer patients in their own homes Marie Curie Cancer Care, now has hospices and research facilities throughout the UK and supports over 40,000 terminally ill patients and their families. Pictured giving her pocket money to help is 6 year old Jaslene from Bean with a Rotarian helper.